Are you ready to get the first of many good nights’ sleep? You may be only missing one thing: A good mattress. Here’s the problem—there’s a lot that goes into finding the best mattress for bunk beds. It’s not the same as choosing your typical mattress for a standard bed. You need to think about other factors since the mattress will be on a loft. Guide: Want to learn which mattress is best overall? Learn more here. As usual, you’ll need to consider size, thickness, firmness, and more. But with the added loft element, you now need to also think about safety, headroom, and a few more things that we will cover in this article. Many factors go into this big purchase, and things can quickly get confusing. 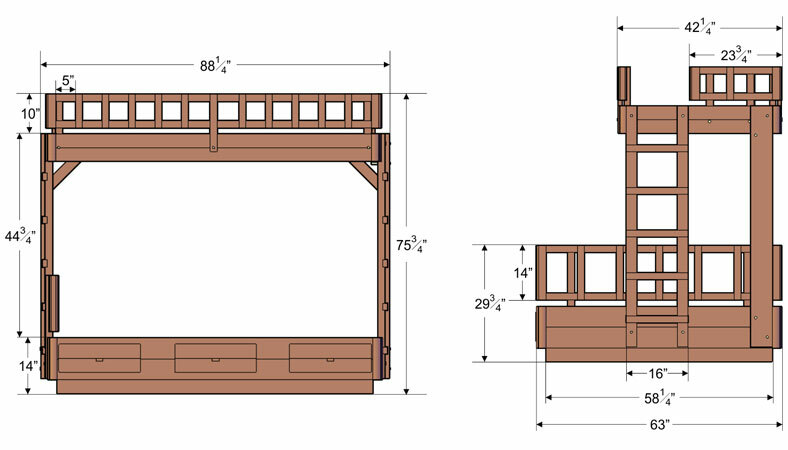 Don’t get overwhelmed with all the aspects of your next bunk bed. The first thing you’ll need to ask yourself is: Who is this for? The one you choose will differ if it is for your toddler twins, your college-aged child, or yourself. With the user in mind, consider the factors below to help make your decision easier. Find the one that will effortlessly get you or your loved ones to dreamland. Let’s get started. 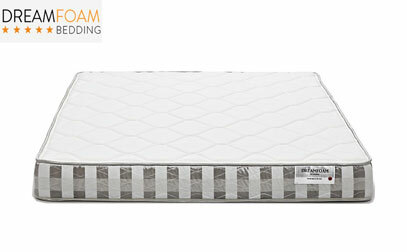 With this twin mattress, you can trust that both of your little angels will be tucked away safe and comfortable. Conveniently coming in a set of two, you can purchase both products at once. This Zinus model features Steel Bonnell coils for support and is made from high-quality foam. This product is also CertiPUR-US® Certified – a U.S. certification for the foam inside. For your peace of mind, it also comes with a 10-year limited warranty, helping to assure that it will last the test of time. 6 inches thick, this product just surpasses the minimum requirement of 5 inches, leaving your child with plenty of guardrail space left over on most models. This one also works well for trundle beds. It is on the firmer side, so it’s ideal for those looking for something a bit harder. You likely cannot go wrong with this twin mattress. This versatile number promotes comfort and safety in all sorts of kids’ beds. This model’s tri-zone construction offers incredible support and a comfortable feel for almost anyone. 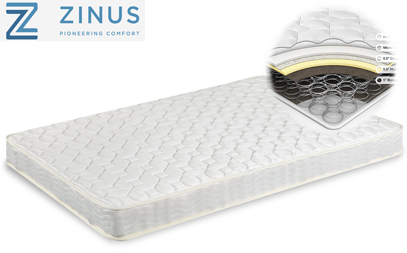 The 6.25-inch tri-zone core, paired with a .75-inch quilting layer, results in a 7-inch mattress made in the USA from CertiPUR-US® Certified foam. This is an excellent option for parents because it is thin enough for safety and sufficiently thick to maximize comfort. The listing offers this in a twin, a twin-full combo, a twin-twin combo, a full, and a queen. That means regardless of the type of bunk bed you own or the size you are shopping for, this product should have whatever you are looking for. This product offers a firm support core, designed to contour to the body. This relieves pressure points along the hips, back, shoulders, and neck. 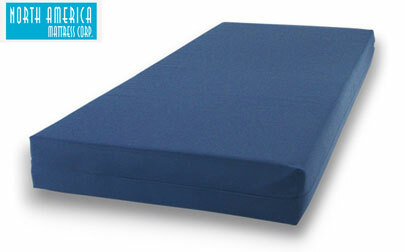 This microfiber mattress is a great way to top off any bunk bed. A full-size mattress with 6 inches of thickness, this option packs in plenty of comfort. Constructed using a polyester/cotton blended fiber, if anything is ever to spill on your bed, it’s easy to wipe clean quickly. Featuring the “GREENGUARD Gold Certification,” you can trust that this is a quality selection, and one of the best choices for your needs. With the same product available in a twin size, you can easily get the matching set for a twin model! This Lucid model is a gel memory foam option. 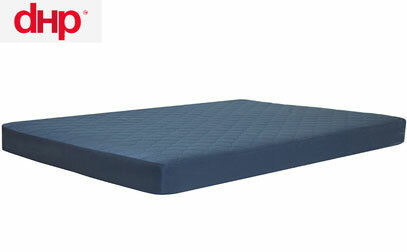 At 5 inches thick, this is one of the thinnest bunk bed mattresses you’ll be able to find. The gel foam provides a cool sleep experience and also conforms to the body to offer relief to pressure points. Boasting dual layer technology, this selection is constructed from 1” of soft, ventilated cooling, and a 4” supportive base foam core. Open cell construction results in a more long-lasting, durable option. Rolled up and compressed for shipping purposes, this product is a cinch to set up and move after it arrives at your door. CertiPUR-US® certified, resistant to dust mites, and safe for children, this model pretty much has it all. This is a softer model, so for those who like softer models, this may be a great option. Also, it’s probably not the best for heavier weight sleepers with how thin it is, which is a common problem for these thin models. Best to leave it for the kids and not choose this model if you are an adult trying to find the right bunk bed mattress for you. This model is designed for use in an RV but is ideal for a bunk bed or loft bed as well. It’s economical, covered in a comfortable nylon fabric. 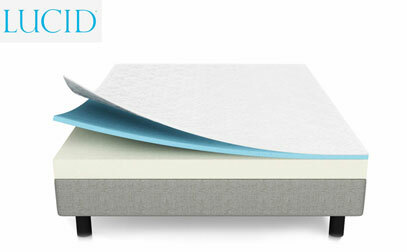 It’s constructed from the same amazing medium-dense foam through the mattress’s entirety. Hypo-allergenic, fire retardant, anti-bacterial, and dust resistant, what more can you ask for? It’s also easy to clean using mild soap and water. The foam is CertiPUR-US® certified, assuring you that it meets all CertiPUR-US® safety requirements. The strong nylon cover was created to have a longer lifespan than a typical mattress cover, and provides an easy surface for cleaning. With the medium-firm foam, it’s easy to flip over for extended years of use! Finding the right bunk bed mattress size is a subjective decision. However, there are some points you’ll want to keep in mind. Your current bed is likely made for a twin or full-size, as these are the most common. So, that’s probably the size you’re locked in to. That is, unless you want to purchase a new one. Don’t have one yet? Does the one you have leave you with some wiggle room? That means you can make the choice for yourself. A twin or full-size are the most common types. If it is for an adult, then consider a larger size or at least a twin XL if the bed will allow it. Want a larger-sized type, like a queen or king? Some examples use a larger size on the bottom part than they do on the top. For those wanting a larger size, you may prefer a larger base bunk bed and sleep on the bottom section. Depending on your weight, thickness might be very important. The thicker your mattress is, the more comfort and support it can offer. Standard twin size is between 7.5 and 12 inches thick. The top one should not exceed 7 inches. Otherwise, it can stretch taller than the bed’s guardrails. You may be able to use a thicker mattress safely if the guardrails of the bed are exceptionally higher than most on the market. Typically, most people would never go out seeking a thin bunk bed mattress. However, when each inch of your mattress thickness takes away from valuable guardrail height, thinness suddenly becomes desirable. The more guardrail space left once it is in place, the less likely sleepers are to roll out of bed. The bottom one does not tend to have safety restrictions regarding thickness. However, the thicker the mattress, the less headroom there will be. For this reason, a low-profile mattress can be ideal for the bottom bunk as well. Even if a child will sleep in the bottom part, headroom is still an issue. Don’t forget that tucking in the kids and reading bedtime stories tends to be an adult’s job. In this case, it’s certainly nice to be able to sit up. That’s not the only reason thinner options tend to be preferred. Have you ever tried to make a bed while suspended on a ladder? If not, you may find that it’s not fun! A thinner option will tend to be more lightweight, making it easier to lift the mattress and tuck the sheets underneath. With all the maneuvering that’s involved with making a top bunk, you’re likely going to want a thin or lightweight option. You can thank us later! We know what you’re thinking. Is thinner better? Doesn’t that mean sacrificing comfort? Well, not exactly. With a good quality product, you can maximize comfort while minimizing thickness. Bunk bed manufacturers know that thinner tends to be better in this situation. So, they capitalize on every inch to stuff in as much comfort as possible. By doing your research and finding a quality product, you can get all the benefits of its thinness, while still maximizing comfort. Firmness is all a matter of preference. Whatever makes you—or the person who will be sleeping there—most comfortable is the ideal fit. Of course, if you ask your kids if they want a firm or a soft mattress, chances are good that their eyes will immediately glaze over. A mattress is a years-long commitment, so it doesn’t hurt to go the extra mile. Take them to a store and have them lay on a couple. This helps to find out the level of firmness they are comfortable with. Then, keep that in mind during your search for the right mattress. A loft bed is a single bed raised up high, allowing you to use the floor below for a whole myriad of purposes. In essence, loft beds are bunk beds with no bottom bunk. This gives kids the “up high” feeling and saves space at the same time—two birds, one stone! It’s good to ask for someone’s opinion who has used a specific mattress before pulling out your credit card. They can be a costly investment, and you don’t want to make a purchase you’ll later regret. By reading customer reviews, you can get opinions from people who have actually slept on it—or at least, whose kids have slept on it. Don’t just read one review and make your decision, though. Ask for second and third opinions. Read the most favorable and most critical reviews to get an idea of the best and the worst of your future bed. When reading, it’s important to take things with a grain of salt or put them into perspective—some of the people who take the time to review tend to be those who only had horrific or incredible experiences. Chances are, your experience will fall somewhere in the middle. Show me a kid that doesn't love one? They’re fun and recreate the feel and atmosphere of a summer camp! They offer a child their own space to personalize and enjoy. Not only that, but they offer benefits to parents as well. They’re space-savers and provide more room in the children’s room for other things when there aren’t two beds. However, if your child is pleading for this type of bed but doesn’t have a sibling to share it with, what can you do? That bottom bed likely won’t be utilized enough at the occasional sleepover to be worth it. That’s where loft beds come in! The best loft beds tend to incorporate a storage area, desk, or play space separated by curtains into their design—and if they don’t, you can add those things yourself. If your loft bed is a simple, bare-bones raised bed, you can still make the most out of that space. Pick out a desk to create a study space beneath, or attach curtains to block off the space for storage or a hideaway play area. The principles for finding a loft bed mattress is similar to that of bunk beds. This means you’ll want to follow the same rules for considering the loft bed mattress size. Try to follow the same considerations for mattress height for bunk beds. Is it Safe to Sleep on the Top Bunk? This is the question most parents face when their kids come asking for a bunk bed. Parents want to give their little ones everything they want in life. However, safety is obviously the priority. As a parent, it can be difficult not to imagine your child on the top part, rolling over after a bad dream, and toppling off the side of the bed. This is why parents often ask, is the top bunk bed safe? The answer is yes, absolutely—usually. If you are investing in a well-built bed constructed from high-quality, safe materials, then your little one is in safe hands. The next thing you want to look into after the materials it is made from is guardrail height. Like we mentioned before, the thicker your bed is, the less guardrail is left exposed. The higher the guardrail is in the first place, the less of an issue that can be. Should the Bed Have Stairs? Whether the bed should have stairs is a matter of preference. However, one thing is certain: Stairs certainly can make things easier! Actual stairs take up more space than a ladder but can be safer and easier for younger children—or parents while making the bed. However, children who are a bit older are more than capable of using a ladder, which does save space. Some don’t have stairs or a ladder and, rather, have slotted ends that can be used to climb up. Whatever the method is, as long as there is a safe way to get onto the top bed, then it doesn’t matter. Try looking at different styles and just pick the one that you and your kids are most comfortable with! Are They Safe for Toddlers? What child doesn’t want a bunk bed? Of course, it becomes a parent’s discretion to determine when their wee one is old enough for one. So, when is the time right to give into your children’s pleas and purchase one for them? A good general rule of thumb is not to let children under the age of 6 use the top bunk. However, if you have two children of different ages, then your child of 6 or older can use the top bunk while the younger one is safely on the bottom. If both of your children fall under the age of 6, though, it’s best to tell them to wait until they are a bit older. See even more great picks for kids here. Are They Too Small for Teens? Bunk bed mattresses are usually somewhere around 6 inches thick, which may be too small for a rapidly growing teen. You’ll want to consider weight limits for both the mattress and the overall structure of the frame when you are deciding if a teen has outgrown their bunk bed days. Height may also be a factor, and no teen wants to sleep with their feet hanging over the top bunk. If you are looking to upgrade your teen’s sleep experience, you’ll want to pick a bed and a frame that can allow them to comfortably transition into their adult size and shape, and the correct investment could even follow them off to college (you can see our top bed picks for teenagers here). Look for versatility and durability when shopping for growing children, and you’re likely to see a better return on your investment. Should You Go with Memory Foam? The two most common types for bunk beds are spring and memory foam. But which one should you go for? Foam allows the user to sink into them as the material forms to the body like a cloud. Spring mattresses are a standard option that provides optimal comfort and support, but they might have a shorter lifespan, depending on the materials. Surely, this type is interesting for kids, because of the springs that make it bouncy, but if you're a person who wants the safest option, then it could potentially be better to opt for the first choice. With a memory foam mattress, jumping and bouncing are difficult and unrewarding. Think about encouraging safety instead, and not giving your children any reason to want to jump on their beds. Memory foam beds are a great—and comfortable—way to do this. However, if you do have a spring mattress you were hoping to use on the bunk bed, consider saving it for the bottom section. This at least leaves you with one product less to buy, and it also potentially minimizes the risk of injury. As you can see, there are many great options out there to choose from—and there’s no one-size-fits-all bunk bed mattress that will fit everyone’s preferences. Whether you’re looking for something firm or soft, and depending on what size you are after, your perfect fit may be very different from someone else’s. However, with a little bit of dedicated research, you should be able to find the best bunk bed mattress —and hopefully, our top 5 picks have helped you narrow down your decision! Can you provide information on the use of chemicals in these mattresses? Since these are for children, this should be a very important consideration. One mattress above specifically says it’s flame retardant. I would not include such a mattress on a list of recommended mattresses for children. These chemicals have been proven to impact fertility and cause cancer. Thank you for responding if you have recommendations for mattresses that are not soaked in chemicals – perhaps some of the above are chemical free, which would be great to know. Thanks! You are right, we will remove the product with flame retardant and add more information about it in our next content overview. Hey MarryAnn, you are right. I’ll check if some of them have Twin XL or list a product that has. Can you recommend any mattress protectors? I’m planning to buy the lucid mattress for our bunk bed but I’m habing a hard time finding a mattress protector that will fit a 5” mattress. Any suggestions would be much appreciated! Erica, you might also look for Sofa bed mattress protectors or ones listed for RV mattresses because those both tend to be thinner. We hope this helps! Wow. Erica, that’s a tough one. 5 inches is not a common height for a mattress so I imagine protectors will be hard to find. You might consider reaching out to Lucid to see what they recommend.